Richard McPherson holds the title professor emeritus at James Madison University, where he taught organ, harpsichord, music theory, and founded a degree program in Sacred Music in the School of Music. He earned the B. Music degree from the University of Michigan, M. Music from Wichita State University, Doctor of Musical Arts from the University of Michigan, with additional post-doctoral studies at Westminster Choir College and the Eastman School of Music. As a student, Richard studied piano with Charles Fisher and organ with Marilyn Mason, Robert Glasgow, and Russell Saunders. Richard has been a life-long member of the American Guild of Organists having served as Faculty Advisor of the JMU Student Chapter, Sub-Dean of the Blue Ridge Chapter and, currently, as Sub-Dean of the Winchester Chapter. In addition, he served on the Steering Committee for the AGO Region III Convention that was hosted by the Winchester Chapter in July 2013. Throughout his career, he has maintained an active performance schedule in both solo and collaborative endeavors; major venues include appearances at the National Cathedral and National Shrine of the Immaculate Conception in Washington, D.C., the Cathedral of Mary Our Queen in Baltimore, and St. Thomas Church in New York City. He has held positions as Organist or Organist/Director in Unitarian, Methodist, Congregational, Presbyterian, and Episcopal Churches in Indiana, Kansas, Michigan, and Virginia. He has recently accepted the position as Organist at Trinity Episcopal Church, Upperville, Virginia. 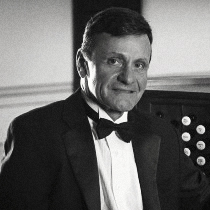 Richard has assisted Michael Main as organist, pianist, harpsichordist, and rehearsal accompanist for the Arts Chorale of Winchester since its founding in 2001.